These LEGO Micro Cities are made entirely of real LEGO bricks. Each city rises from a base that is 20 x 20 LEGO studs, which is about 6 inches or 15 centimeters square. The tallest city is 10 inches or 25 centimeters high. Making LEGO creations at such a small scale is known as microscale building. LEGO microscale building blends artistry with an engineering puzzle. LEGO is an unusual artistic medium in that it’s made with precisely engineered pieces that only fit together in a specific way. The open-ended forms available to other 3D mediums such as pottery or wood carving are impossible with LEGO. With LEGO you have to find the right piece or compromise. It’s creative in the way architecture itself is creative. The limitations form part of the work. Another aspect of microscale building is reinterpreting LEGO elements for functions that are far from their original intent. For example, a minifigure chainsaw is used as an architectural ornament topping a skyscraper in one of the cities to follow. There is no glue used in the LEGO Micro Cities. 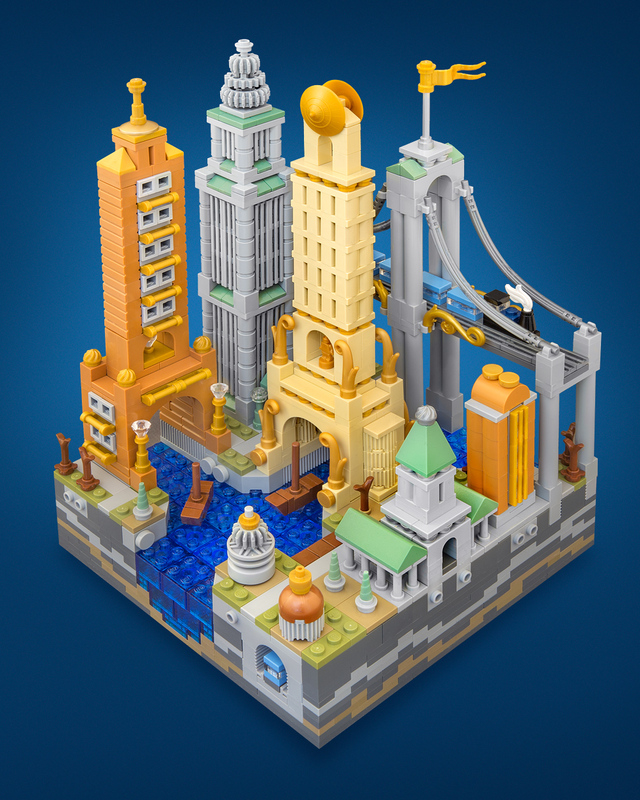 Each city can be held upside-down without losing pieces using only LEGO’s built-in clutch power. Over 2000 pieces are used in each city, and they take several weeks to design and build. You will notice a myriad of architectural styles used in the LEGO Micro Cities, and sharp observers will see the influence of individual architects such as Zaha Hadid and Santiago Calatrava. With that in mind, it is never the intention to duplicate existing buildings. These cities will take you to a place you haven’t quite seen before. Another influence on the LEGO Micro Cities are the world building techniques used in movie making. I’m often more interested in the background of a movie than the action in front. Making a believable world is the foundation for everything that follows. During the hours spent building a micro city an entire history and culture of the city takes shape in my mind, which then guides the direction of the construction. 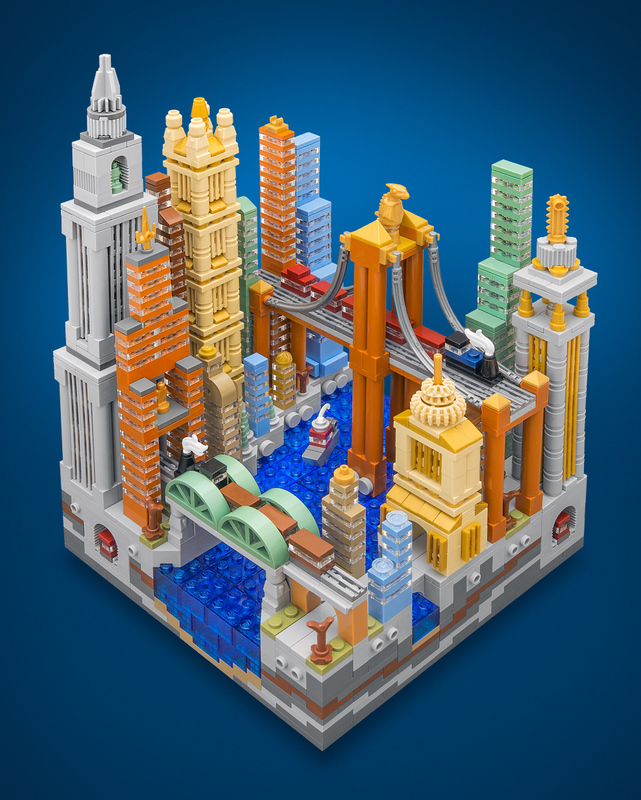 The goal of LEGO Micro Cities is giving viewers a sense of wonder as you visually travel through a miniature world you can hold in your hands. ©2018 Jeff Friesen. LEGO®, the minifigure, and the brick configuration are property of The LEGO Group of Companies, which does not sponsor, own, or endorse this site.